The cardinalfishes are excellent aquarium inhabitants, often remaining relatively small and peaceful. As a general rule, they can be kept in groups, are considered reef safe and adapt well to captivity. Perhaps one of the most well-known members of this family are the bangaii and pajama cardinals, both of which are being aquacultured in large numbers for captivity. One of the most unique aspects of cardinalfish biology is their habit of some species to shelter within the spines of sea urchins, or amongst the tentacles of some anemones. Another very fascinating aspect of cardinalfish biology is their strategy for reproduction. Cardinalfish practice a very unique form of reproduction in which the male fish will hold and incubate the eggs in his mouth while they develop. 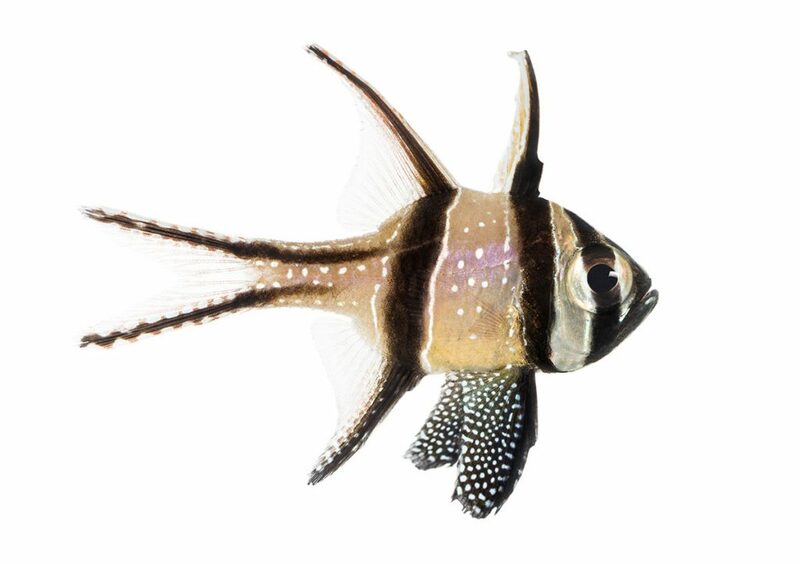 Some species, such as the bangaii cardinalfish will hold the eggs until they have become quite well developed juveniles that resemble miniature versions of the adults! Cardinalfish are in many ways the ideal marine aquarium fish. They are considered a very hardy, do not attain an overly large size, and require only a minimal territory. In addition, they are not considered aggressive fish and can be kept with members of their own species. Some species may exhibit aggression towards conspecifics during mating, so it is advisable top provide amble hiding spots in order to avoid the weaker fish becoming overly stressed. In the wild cardinalfish consume primarily zooplankton, so it is advisable to recreate this diet in captivity through feeding high quality frozen zooplankton and pellets. Many species of cardinalfish do not require a very large tank. However, it is important to consider carefully what species of cardinalfish may be best for you tank. While many species of cardinalfish do well in a small tank when kept individually, many species will benefit from being kept as groups in lager tanks.